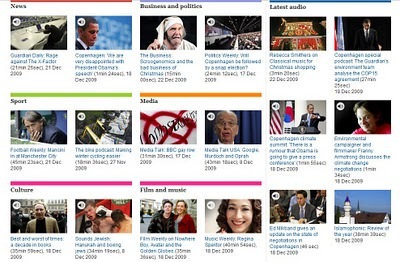 There's been plenty of doom and gloom around the Guardian Media Group (GMG) this year. In March, GMG Regional Media shed 150 jobs and closed eight local newspaper offices around Manchester. Then in the summer, it briefly seemed the Observer could close altogether before Guardian News & Media (GNM) unveiled plans for a new slimmed-down version. Finally, it was reported earlier this month that the Manchester Evening News could even be sold to Trinity Mirror. But GMG's year has ended on a high with news that the online division is booming. 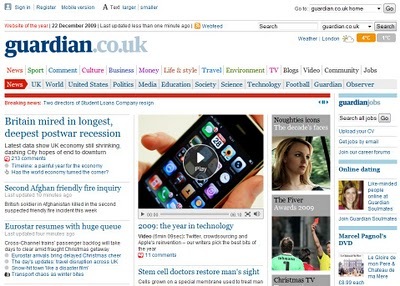 The Guardian.co.uk website, which features content from the Guardian and the Observer, received 36 million unique visitors globally in November, according to figures from the Audit Bureau of Circulations Electronic. This is well ahead of nearest rivals Mail Online and Telegraph.co.uk (both 31 million). Not only that, it's more than any other UK newspaper site in history. Emily Bell, director of digital content at GNM, commented: "We are thrilled with the November figures. October was a strong month for us but the fact that the number of monthly unique users has risen by 13 per cent in just a few weeks indicates that our online audiences are increasingly engaging with our content." Twitter feeds. 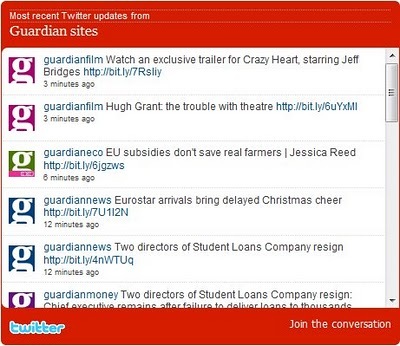 The Guardian is renowned for managing a whole host of Twitter accounts – 41, in fact. These include big hitters like @guardiannews, @guardian_sport and @mediaguardian and smaller feeds like @guardianletters and @guardiangardens. What this means is that readers can get instant updates solely on subjects they're interested in, rather than be overloaded with one mammoth data stream. Audio. It's common knowledge that the Guardian was behind the first podcast to gain mass acceptance – The Ricky Gervais Show. Mr Gervais has since gone solo but the Guardian has built on this early groundwork with a dazzling array of podcasts covering science, film, business, sport and more. Video. The Guardian does a good job of integrating video content across the website. Today's front page, appropriately enough, has a video reporting on the year in technology. Hopefully, the future will see video play an even more important part on the site – and on the new Guardian iPhone app. Of course, the Guardian website is by no means perfect. For starters, there are far too many links on the homepage so the risk of reader fatigue is high. It can also be tricky to identify the newest stories at a glance. And the site design looks positively old-fashioned compared to stylish rivals like the BBC. Still, if you want to see how an old media company embraced new technology this year, the Guardian website is a good example. And with 36 million unique visitors, it's very much the highlight of a difficult year for GMG.